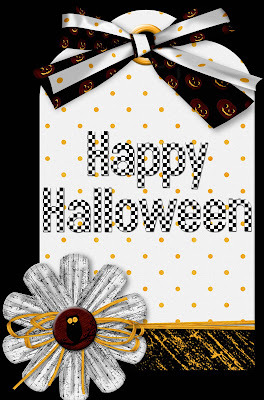 WHO'LL STOP THE RAIN FOR HALLOWEEN??? 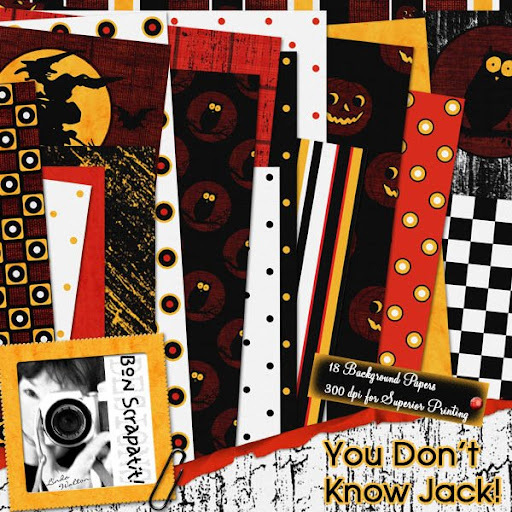 This was actually a spur of the moment thought as I had started work on revamping one of my VERY first scrapkits, *You Don't Know Jack*!!! It was originally given out in two parts (many of you will remember this as a Scrap-A-Deal at 3Scrapateers!) and I DID NOT include "Jack" in the first part thus cometh the title that NO longer makes "real" sense, however, like glue it is sticking!!! LOL! Since we've finally had a few sprinkles here in the foothills, along with lots of wind and even a bit of thunder and lightning yesterday, the weather forecast has been for a break in rain for Halloween and I thought I would follow along!!! 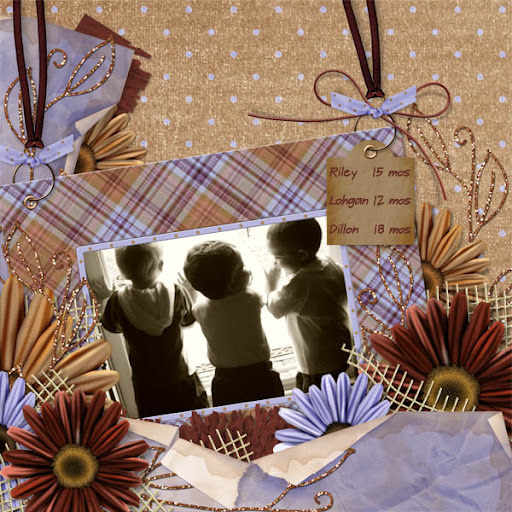 SOOOOOO ... since I did not have time to revamp *You Don't Know Jack* to put into my "guest" spot at the NEWLY decorated and RE-OPENING "Designs By Sassy" (my virtual daughter *hearts*), I am offering the little rascal and his DELIGHTFUL friends right here at Bon Scrapatit Designs as a small TREAT for my fellow SCRAPLANDERS!!! As always, I try to make each of my scrapkits versatile enough to scrap everyday photos, so this is NO exception and you will find MANY simple and geometric patterns to use for your hybrid projects as well. REMINDER to my fellow Americans: those living in states that observe Daylight Savings Time, we go back to Standard Time THIS weekend!!! HAPPY, HAPPY everyone ... "OWL" be back soon and thank you for your CONTINUED support and WONDERFULLY delightful and SWEET comments! I read them all - just wish I could reply to them all!!! Y'all keep me smiling BIG!!! MWAH! LOOKY WHO I FOUND OUT SINGING IN THE RAIN!!! *If music starts from MP3 player, you can pause it by clicking on the third button from the left over on the sidebar. It should not start if you do not scroll beyond this post. Okay, I am just a WEE bit embarrassed! What index finger you are asking??? Hmmm ... I watched several versions over at YouTube and I'm thinking it was on a remix or something. Sorry! If I locate it, I will exchange it. If not, well, I'm ready for the LOONEY bin!!! ROFL! PRECIPITATION ... INSPIRATION ... WHAT ARE THE CHANCES? I'm still a BUSY, BUSY little beaver over here at Bon Scrapatit Designs tucked away in a smallish corner of SCRAPLAND! Thought I'd peek my head in and leave you a little goody that just HAPPENED along last night!!! You would think, by the looks of this layout and the photo, that my inspiration for *Chance Of Rain* may have come from IT! Believe it or not, it did NOT! I had completely forgotten about these photos until I went searching for a photo I remembered taking on our property some time ago of the blue sky with clouds that gave the impression they wanted to sprinkle a wee bit of moisture upon us, however, were unable to squeeze even a drop out!!! 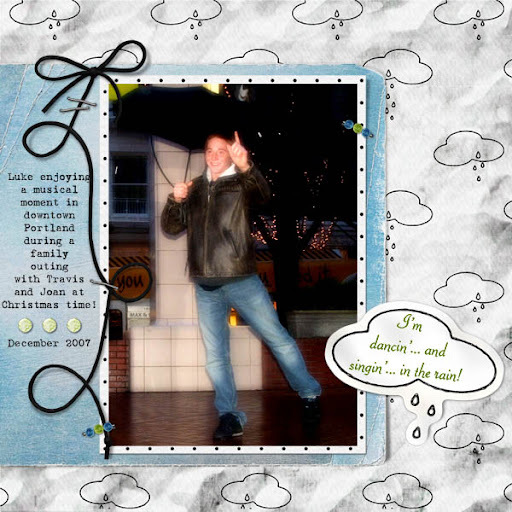 Anyhoo, this photo is the eldest of my twin boys, Luke, taken in Portland, Oregon during our stay in Vancouver, Washington with my daughter Joan and her new husband, Travis, last Christmas. The kids took us to downtown Portland to enjoy the Christmas lights, festivities and a hot cup of "our choice" from Starbucks!!! What a perfect combination for this chilly evening that produced some drizzles here and there! Enough so that we took our umbrellas! You will note a BONA FIDE "word cloud"!!! This is one of the reasons why I will usually break from designing a kit and scrap a layout or two as I normally will find a few things that I might consider useful in scrapping with it!!! I originally had wished to place the cloud "above" Luke's head, but it did not look right with the twisted string, so I placed it lower on the page. It's a STICKER and it STUCK there!!! ROFL! P.S. 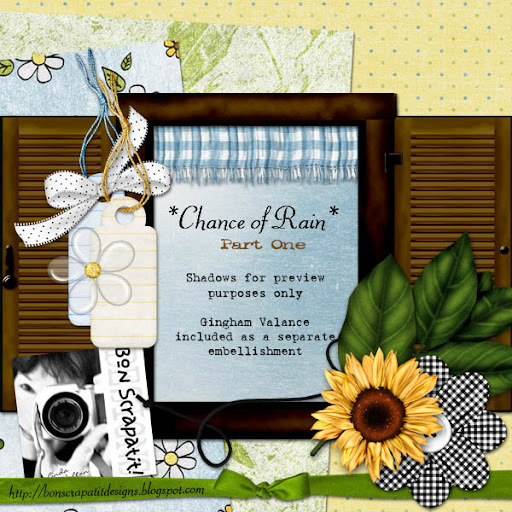 Ohhhhhhh - my "virtual" daughter, Sarah Laming aka Sassy Scrappin' aka Designs by Sassy has a NATUALLY rockin' new grab bag reveal for personal use!!! It's GORGEOUS and the price IS right! Check it out HERE and tell her that her VM sent you!!! CHANCES ARE ... IT'S GONNA RAIN GOODIES!!! Uh, er, hmmmm .... well, EVERYTHING seems to be running slowly today, not JUST me!!! PHEW! That's a relief! I was beginning to believe that I was ready for the trash heap I tell ya, my goodness mio! I don't think a dinosaur was as slow as I've been today. 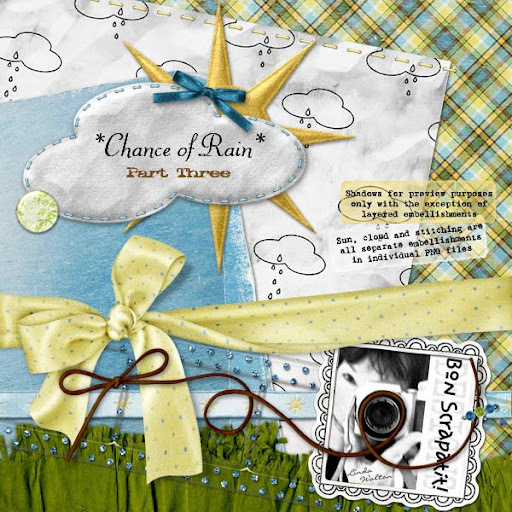 I have to go and find something to do around the house while waiting for Photoshop to open, my blog music has been intermittent and now 4-Shared tells me it is going to be over half an hour for me to upload *Chance Of Rain, Part Three*!!! LOL!!! He, he ... so much for the LIGHTNING fast Internet Highway!!! I think the Bay Area commute traffic moves along faster than things are on the Internet today!!! All kidding aside, no worries! I am just HAP, HAP, HAPPY to be here and helping in a small way to ensure the preservation of memories all through out SCRAPLAND!!! No talkie from me today! OH MY, I can hear those sighs of disappointment!!! ROTFLMBO!!! A song comes to mind - "A little less talk and A LOT more action ..."! You can scrap and I can get back to the three collaborations I'm desperately trying to get moving along on!!! Once I've finished up my work, I'll take a day or two and work on my poor computer! To ALL who have sent me e-mails over the past several days, I shall reply just as quickly as I am able as some of you are asking for links that seem not to be working from some time ago. I will get those links to you ASAP. There are a few of you that have sent me QP's some time ago - would you please resend if you are up to it as with all of my computer woes this past week plus, I am LOST!!! LOL! Understatement, but I am sure you get the picture! The more I am looking at the slideshow, I am thinking you are NOT able to add your layouts, so I will at some point in the next day or two, change that up so that you see an "ADD" button in the upper top portion to click on and then to upload your image. Looks like our resident meteorologist, yours truly, was WRONG as to when a *Chance Of Rain* was to arrive!!! LOL! I hope to have *Chance Of Rain, Part Three* posted sometime prior to mid-afternoon tomorrow. I just need a GOOD night's sleep as I just realized that I only had a few hours last night! Sweet dreams to all on their way and good morning to those rising! WOO HOO!!! SLIDESHOW IS UP AND THE FORECAST IS PREDICTING MORE CHANCE OF RAIN LATER TONIGHT!!! Are you ready??? ROFL! Just stopping in real quick to let y'all know that I FINALLY found the coding to add to this newer template I installed on my blog so that I can now add WIDGETS within the body of my blog. PHEW! The ONLY dilemma I am having on my side is that I am NOT seeing a place for you to click on to add your own layout and I am hoping that one of you will be SO kind as to try to do so for me and give me some feedback as to whether it is working as it should be - THANK YOU in advance! If it does not appear to cooperate then I shall have to opt for another style that will show forth the ADD YOUR IMAGE icon for us! Just a bit of a PITA, but nothing that a few clicks of the mouse won't resolve!!! 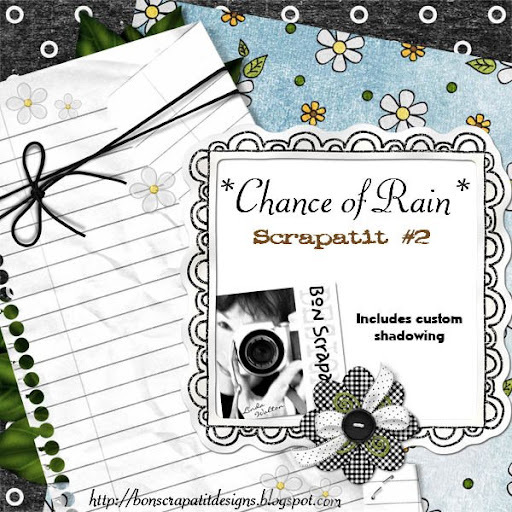 He, he ... Oh, and I just heard an UPDATED weather forecast from my resident meteorologist here at Bon Scrapatit Designs nestled in SCRAPLAND - another *CHANCE OF RAIN* later tonight!!! IT IS NOT JUST SPRINKLING, IT'S POURING FORTH GOODIES HERE IN SCRAPLAND!!! No need for an umbrella in this DOWNPOUR!!! But you'd better clear out your hard drives and make room for some AWESOME scrapping materials! Short post as I am WAY past my bedtime (I should be just about ready to get up in fact!!!) and it has been a rather assorted day starting out with a FABULOUS 4-hour Skype chat with the LOVELY Vicki Parker! Yes, and Vicki, Robert has nicknamed you "4-hour Vicki"!!! LOL!!! Speaking of Vicki, she, Mel AND Charlie have DEBUTED their first collaboration as a trio a bit earlier. The title is *Putting on the Glitz* and it is BEAUTIFUL ... OF COURSE! Make sure to visit ALL three ladie's blogs to collect ALL of the pieces over the next several days! You can start with Vicki's blog HERE and then link to the others from there! ENJOY and PLEASE make sure to leave EACH one some LOVIN' for their generosity in sharing with ALL of us here in SCRAPLAND! Thank you! One more MUST-HAVE is HERE at Snowsmoon's Design! 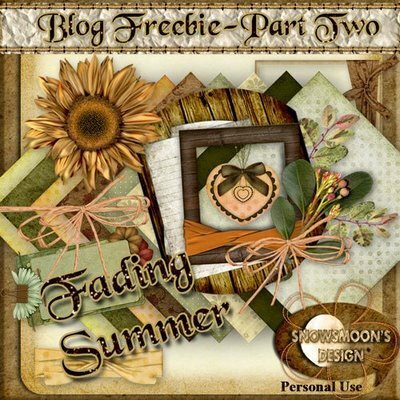 My BFF, Dawn, has a MOST gorgeous blog series going on named, *Fading Summer*! You will LOVE it! Make sure to check back often so as not to miss out on any of the installments!!! And, PLEASE leave Ms. Dawn some LOVIN' too! BEAUTIFULLY done girlfriend!!! Have I told you lately HOW much y'all ROCK??? AND ... then SOME!!! MWAH! 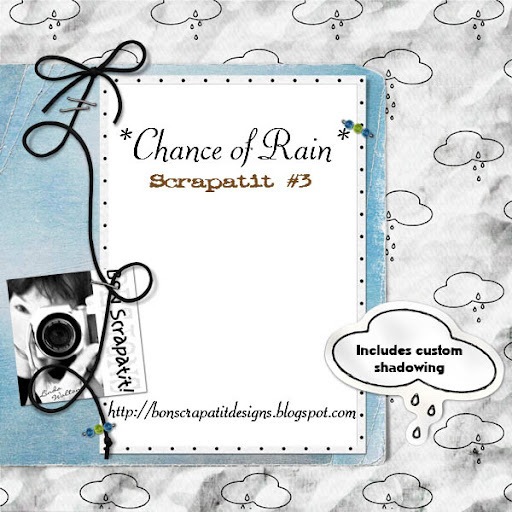 My GOODY for you today is *Chance Of Rain, Scrapatit #2*, which I have used to scrap one of Joan's wedding photos from this past August. It is of my daughters and I as all of us girls are getting ready! I am being just a wee bit coy with Rebecca's (Rebecca MacLachlan Photography) camera as I am the ONLY one who had not had her makeup applied yet!!! April, my oldest daughter and firstborn to my right, did my makeup for me. It was like OLD times as she has always had a "natural" nack for doing hair and makeup as long as I can remember!!! Have an INCREDIBLY beautiful week everyone, thank you for visiting Bon Scrapatit Designs and thank you for ALL of your LOVELY, LOVELY comments!!! SCATTERED SHOWERS THROUGHOUT THE WEEKEND IN SCRAPLAND!!! G'day everyone!!! Hope you are finding a BEAUTIFUL start to a MOST glorious weekend! I am OVERWHELMED with your SWEET and HUMOROUS comments!!! You have this girl smilin' BIG!!! Thank you SO much and I am SO happy that you are enjoying the weather here in SCRAPLAND where it SHOWERS goodies 24/7!!! Oh my, can you imagine what it would look like if the SKIES in SCRAPLAND were to ever CLEAR UP!!! LOL! We'd be singing, "I Wish It Would Rain Down" ... NOW!!! ROFL! I told you that I would be back to post a few photos of Kaleb, Grandma's "Little Man", however, I needed to switch gears last night and decided to scrap one instead! Yes, I DID have the opportunity to speak with both my mother and my baby brother. (Thank you for the LOVELY birthday wishes for each of them!) Guess who I talked with the longest??? Uh, huh - my li'l bro!!! OMGosh - and y'all think I can talk a good one!!! I come by it honestly as it's just GOT to be in our DNA!!! LOL! I spoke with Mama for about twenty minutes (I called her at around 9:40 pm PST) as most of my siblings were gathered together, along with several grandchildren, to celebrate!!! They hadn't been together long as everyone works and Mama had slipped off into the other room to chat with me for a bit before rejoining the festivities!!! She sounded SO good! Hard to believe she is 81! So, after saying "good-bye" to Mama, I phoned my little brother who lives in San Antonio, Texas, which puts him two hours ahead of me. OMGosh!!! I am just sitting here thinking that it was after midnight when I called!!! I NEVER call anyone after nine as a rule! LOL! Now I really know we come from a family of night owls as I asked him if the timing was okay and he said it was just fine!!! ROFL! Anyhoo, little brother won out on the time as we talked for three hours!!! After the first time Robert ever heard me on the phone with Tom, he nicknamed him "Two-Hour Tom"!!! Well, I'd better be off - need to get busy on my collaboration designs and shall see you LOVELIES again tomorrow I hope! Meanwhile .... ENJOY the SHOWERING of LOVE and GOODIES here in SCRAPLAND!!! Oh, oh, oooohhhhhh!!! I nearly forgot! 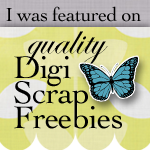 I have added a NEW "freebie" listing site on my sidebar - Digital Scrapbook Faves. Check them out as they have a pretty cool setup and they even have a "wall of fame"!!! P.S. Have you guessed who my collaboration is with yet??? *Chance Of Rain*. Fonts used are CK Quick Stitch and Nueva Standard. Showers of Love supplied by Kaleb!!! OH MY .... CAN YOU BELIEVE IT??? 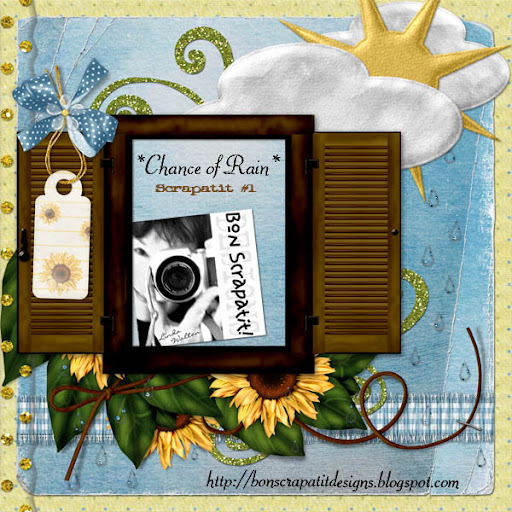 IT'S SPRINKLING HERE AT BON SCRAPATIT DESIGNS!!! WAHOOOOOOOOOOOOOOOOOO!!! I have FINALLY made it back to the WEATHER STATION to UPDATE you further on what's on the horizon weather-wise here at BSD in our FAVORITE Internet place called SCRAPLAND!!! Why y'all ... I do believe I am feeling a FEW sprinkles - how about you??? Open your eyes and LOOK closely! 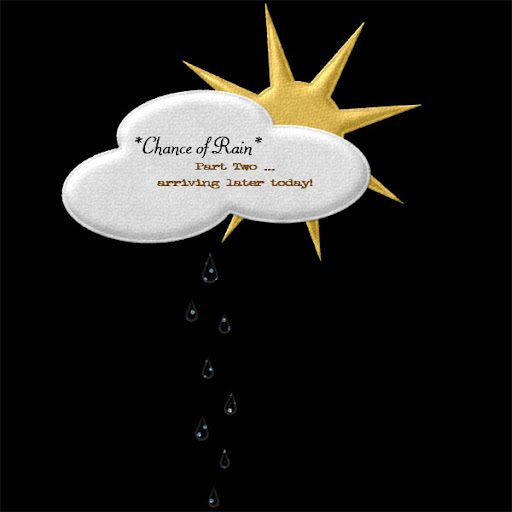 Now, open up your hard drives and CATCH the SPRINKLINGS of *CHANCE OF RAIN, PART TWO*!!! Okay, I'm a bit pressed for time as I have GOT to call my mama and my baby brother to wish them a HAPPY BIRTHDAY today ... before it's over!!! I contemplated calling this morning, but I know my brother is usually BUSY, BUSY, BUSY and my mama wakes late as she is normally a night owl! Anyhoo, I'll have to share about the TWO birthdays being on the same date when I FINALLY get around to sharing with you about being reunited with my birth mother!!! WOW!!! I REALLY do have LOTS to share and I just cannot get it all in one post so I shall share more tomorrow when SCRAPLAND'S weather report calls for yet MORE sprinklings!!! LOL! Once the rains go away, things are going to get rather FESTIVE here in SCRAPLAND as I am working on a MOST exciting collaboration with somebody VERY, VERY special and NEAR and DEAR to my heart!!! I am SIMPLY delighted, MOST honored and I shall finish my work in progress this weekend at which time I shall announce it's RELEASE date!!! WOO HOO!!! I wish to thank you ALL once again for your TECH shares with me yesterday!!! GREATLY appreciated. I would like to clarify though that my troubles began when I STOPPED using McAfee. I've had McAfee's basic virus protection (my tech advises STRONGLY against the suites and my ISP also recommends AVG) for over three years and have NEVER, EVER, NEVER had spyware, a virus or any other such woes as I've been experiencing since purchasing Bit Defender. I even went a week without being protected due to some error on their part. Believe it or not, they were rated NUMBER ONE on the TOP TEN recommended virus programs by the pros!!! ACK! Anyhoo, I still need to run a few more scans and have the spyware removed as well as running a defrag of my system. That is another feature that McAfee took care of for me on a regularly scheduled basis. For some reason I've never been able to get the scheduler to work in Windows!!! Hmmm ... go figure! SOMEDAY ... SOME-DAAAAAAY ... I wish to own a MAC!!! NO MORE COMPUTER WOES!!! Night everyone!!! Sending you LOVE, HUGS and WISHES for a FABULOUS rest of the week! I will try to post photos of Grandma's LITTLE MAN tomorrow!!! OHHHHH ... almost forgot to mention ... I've included the raindrops in a separate file. For those new to digi-scrapping and if your program allows you to do so, you can select, copy and paste from the original file to add MORE drops as I've done in my preview. I was not going to, but have included one file that is the cloud, sun and raindrops together, and another of just the cloud/sun duo. In the next installment or two, I shall include the cloud and the sun in separate files as well as one of the PURE WHITE PUFFY cloud!!! Just in case you aren't looking for rain!!! ROFL! Okay, now, I need to get my self in gear and figure out where to find that code again so that I can add a slideshow for y'all to ADD your OWN layouts to!!! GOSH, GOLLY GEE, I surely am missing them A LOT! LOL! Okay, I just could NOT bear slipping off to bed without stopping by really quick to say THANK YOU to ALL of you who left me GOOD thoughts and some GOOD shares about virus protection and clean up!!! Y'all are just the BESTEST friends a girl could EVER ask for! I am about three-fourths of the way there, stopped to do a little designing this morning and this afternoon, was about ready to take a short nap to refresh when I had a TOTALLY unexpected "surprise" visit!!! 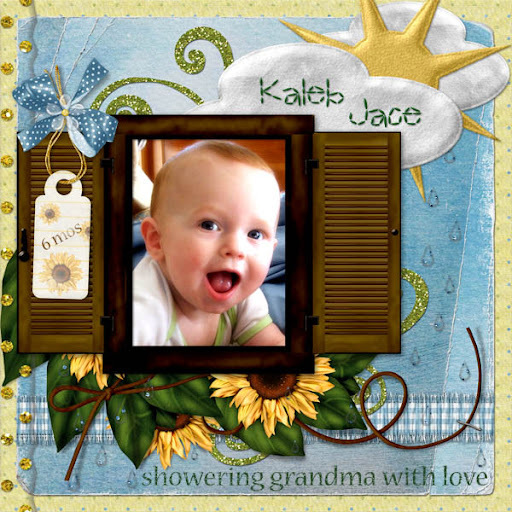 YES, I have finally been able to see Kaleb, who is now six months old!!! He and his daddy spent the entire afternoon and most of the night with us, staying for dinner and allowing Grandma EVEN more time to hold, cuddle and play with her little man!!! Sweet dreams, G'day, Mornin', Afternoon and Evening y'all!!! DID I SAY THE FORECAST WAS FOR A "CHANCE" OF RAIN??? OMGosh y'all! I have been biting at the bit to get in here at update you on what's been going on ... uhm, er ... hmmmm .... or should I say, what's NOT been going on!!! I am sure for ANY of you who have been checking my Pingbox, you SURELY don't think I've been sleeping for the past two days - DO you??? ROFL! I have been having one little difficulty after the other with my computer and finally stripped the baby down today, cleaned her out, ran some scans and will need to re-run a spyware scan in the morning as I was going NUTS not being able to do ANY designing for TWO days and just HAD to work on some tonight!!! I mean, really now, how's a girl supposed to survive without being creative, eh? *chuckle, chuckle* Actually, I had to shut the scan down mid-stream as I needed to reboot after some updates, at which point AdAware had already detected 33 spyware infections - YAK!!! Come virus program renewal time, I am going back to McAfee I do believe as even though Bit Defender was rated on TOP, it obviously is NOT catching all of the Spyware. I did make one adjustment and that was to set Bit Defender to "aggresive" scanning which includes Scan Web HTTP Traffic. I am hoping this will do the trick! Please keep me in your thoughts, prayers, cross your fingers and your toes that when I arise in the morning, ALL shall be well in this little corner of SCRAPLAND!!! I am asking Santa for a NEW computer, but it might not reach Copperopolis from the North Pole until sometime AFTER the first of the NEW year!!! ROTFLMBO!!! HA, HA, HA, HA, HA, HAAAAAAAAAAAA! WAAAA! Oh, PLEASE, PLEEEEEEASE dear Santa .... I've REALLY been a VERY good girl this year and I just have to keep on creating for ALL of my LOVELIES in SCRAPLAND!!! LOL! Can anyone predict the forecast for tomorrow morning her at Bon Scrapatit Designs??? He, he ... see you soon - God willing! Have a WONDERFUL Wednesday everyone! MWAH! PHEW!!! 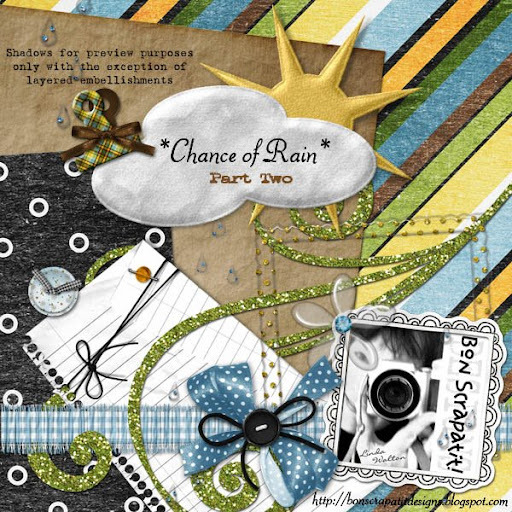 Tis late, but I made it back with *CHANCE OF RAIN*, PART ONE, which shall hopefully bring LOTS of SUNSHINE to your scrapping this week!!! This has been ONE crazy day (yesterday now!) with me up and down, in and out and we even left town to pick John up from work! I can't wait to lay my head down on my pillow and to drift off into LA-LA-LAND! ROFL! Not bad, eh? I get to go from SCRAPLAND to LA-LA-LAND!!! Of course, I do have a ROUND-TRIP ticket so I SHALL be back to SCRAPLAND in the morning!!! He, he ... NO WAY - it CANNOT possibly be RUM DUMMY HOUR, now can it??? NAH, y'all are dreaming and I shall be shortly! ROFL!!! Catch y'all in the morning with some shares! HAPPY MONDAY EVERYONE ... may this coming week bring you MANY new HAPPY memories to scrap!!! P.S. I shall sign onto my Pingbox in the afternoon PST! Stop in and let me know what you've been up to this past weekend or just to say "hello"! The time is 2:50 am PST - link has been tested and is in proper working order! THIS WEEK'S FORECAST: *CHANCE OF RAIN*!!! And what does it mean when it RAINS in SCRAPLAND y'all??? Why, it means MORE time for scrapping!!! WOO HOO!!! Hope to find you all winding down from your weekend, relaxed and ready to take on whatever the NEW week ahead has in store! My finger is coming along nicely and I am glad that I did not PUSH myself, lest I still not be able to carry on as I wish to! Thank you EVER so much for your LOVELY comments and to those of you sharing your "kitty" bite stories. While I have not been bit, I do know that kitty claws are VERY dirty, even on an indoor cat, and that is why I immediately head to the bathroom and literally POUR peroxide over my wounds! After that I bathe it with cotton balls saturated in peroxide and then dab on some antibiotic ointment!!! Can't have enough of a good thing now can I??? LOL! I still have a VERY tender area on the upper-portion of my right index finger, however, I have no areas that have ever been swollen or the least bit red in color which might indicate infection. YAY!!! 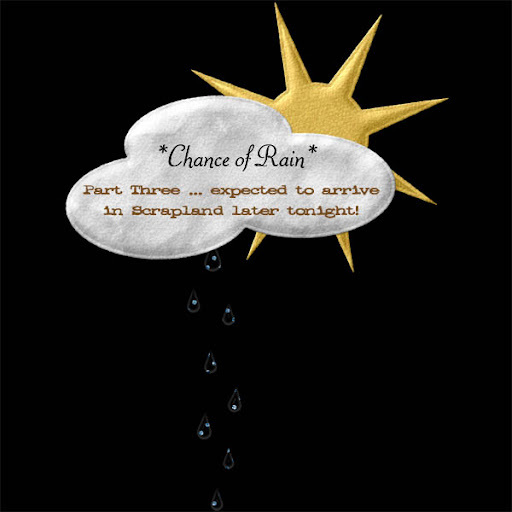 I've just stopped in to let you know that there will be a *CHANCE OF RAIN* this week in Bon Scrapatit Design's portion of SCRAPLAND! Yes, I shall be back later on for the DEBUT of my new FREE blog series for y'all!!! You know, it does NOT matter where in the world and/or scrapland that we live, there is ALWAYS at one time or another, *CHANCE OF RAIN*!!! P.S. Oh, and I shall have to remind myself to share with y'all about my FOUR-WAY today and I am not referring to a STOP!!! He, he ... HINT, HINT: I've been about SCRAPLAND today!!! AL ... ALF ... ALPHA !!! PHEW! I did not think I was going to make it tonight (this morning)!!! I am still healing up from my wounds from Zeke and it is slow going as it is still rather painful to type!!! Moving the mouse around isn't too bad, but typing applies a wee bit more pressure to the upper-portion of my index finger! POOR ME! Forced time-out from the computer! AWWWWW ... I can hear you some of you CHUCKLING out loud!!! HA, HA, HA, HA ... well, if she doesn't take time away voluntarily then someone else will see to it that she DOES take a break! I DO believe I have mentioned a time or two that I am both STUBBORN and DETERMINED and I believe in my case the two go hand-in-hand!!! I know, y'all think it's RUM DUMMY hour over here at Bon Scrapatit Designs, don't you??? AL, ALF, ALPHA!!! You are MOST likely wondering what in the world that means, suggests or eludes to! ROFL! Okay, I'll give it up!!! My father's name was Al (Albert), Robert just watched an episode of "Alf" a few days ago for the first time in years and for this week's FANTABULOUS FRIDAY FREEBIE, I have an ALPHA for y'all!!! WOW, was that a LONG sentence or what! It just ALL popped into my head this morning while working on something entirely different! My mind seems to wrap itself around words and numbers ... go figure! LOL! 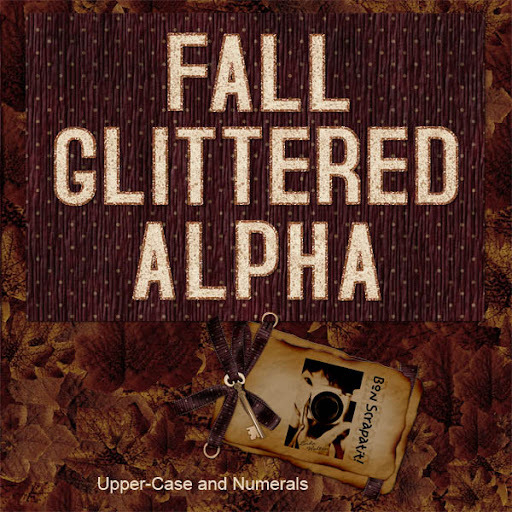 The *Fall Glittered Alpha* was made to coordinate with the goodies I made for this month's Treasure To Scrap Treasure Chest, however, it makes for a WONDERFUL stand alone alpha as well! I am back on my Pingbox, so please feel free to stop in a say "hello"! Thank you Amanda in Oklahoma for stopping in and for such a SWEET comment! I answered back but you were faster than lightning girl ... Amanda HAS left the Pingbox! I TOTALLY chatted with Stacy from over at Kalo Designs. This was Stacy's first time to ever IM and she took to it like a duck to water! I had an awesome time getting to know more about you Stacy, aside from the fact that you are an AMAZING designer and a TOTAL sweetheart! We actually have quite a bit in common. Stacy has twin boys that are TODDLING around while mine are probably just a few years younger than she!!! I have homeschooled and she is serious considering it, we both grew up in the Bay Area here in California and we both LOVE to people watch!!! Those are just a few things that we share in common. I hope to chat with you again soon Stacey! I wish everyone a MOST incredible weekend - may you scrap your hearts out!!! Short post tonight as my fingers are giving out on me and so are my eyeballs! P.S. Robin - good to see you about again darlin' and thank you for the sweet well-wishes. and for sharing your kitty experience. How COOL is that, you still have that very cat and her babes! That is really a VERY touching story for any of us animal lovers! Beth - if you are reading this, would you please shoot me an e-mail as I'd like to discuss your wishing to remove PSE 5 and your fear of doing so! I think it might be for the same reason I was and I've just recently removed PSE 2 and 4 (I did remove 3 sometime ago!) and Photoshop 7!!! The time is 2:10 am PST - link has been tested and is in proper working order! Have a FANTABULOUS Friday y'all!!! MWAH! Hi y'all! Just stopping in to let you know why it's been SO quiet here at Bon Scrapatit Designs the past two days; i.e., NO ME on the Pingbox!!! Some of you may have caught my last TWEET on TWITTER, but those who have not, I had an appointment at the clinic first thing yesterday morning. I'm due for a refill on my Armour Thyroid and because we have a "new" doctor, he needed to see me personally before refilling my prescription. Anyhoo, I was QUITE impressed with Dr. Nguyen (pronounced "win"). Stephanie, the PA is no longer on board - a whole new crew with the exception of Ms. Tanya, the RN who is the only recognizable face amongst the crowd! My temp was 97.2 (low and typical of hypothyroid, does this NOT tell you something? ), BP was 116/74. YAY! I have always had good blood pressure and even after the "whirlwind" of a car ride with my oldest son who came to pick me up, I am NOT hypertensive!!! LOL! It was rather humorous as we were accelerating "down" the hill and about to take on the the sharpest corner of our wee journey, when I calmly spoke these words to my son, "You know son, it would really be nice if I am able get a GOOD blood pressure reading at the clinic this morning!" He cracked a little smile on his face and told me that he'd just been thinking the same thing before I mentioned it! Actually, it tells me a great deal about myself in that stress does not bother my blood pressure, nope, just wreaks havoc on my digestive tract! LOL! John, my youngest, was here when ALL the drama occurred and he told me that I should NOT bother with Zeke when he gets "sketchy" like this. I replied that I agreed and that I've learned the hard way to say the least to leave well enough alone! I wasn't even upset with Zeke as I really wish to know what has traumatized him so much that he gets this way. Oh well, I shall inquire at the vet when I take him to get neutered. My hand still hurts and I had to bandage my right index finger after the second go-round in which I was holding Zeke while in a squat position, lost my balance a wee bit and my knee bumped against our bedroom door. Zeke just "lost it" and went flying out of my hands leaving me with an instant spurt of blood. Where is the vial when you need it??? ROTFLMBO!!! I had come back in to the computer to work on the kit I am revamping and was dripping blood on my mouse pad so I figured this LOVELY wound warranted a bandage!!! So y'all, here I sit wounded and wondering!!! Wounded yes, but REALLY wondering what is spooking my poor kitty so. I am simply hoping and praying that I NOT contract "cat scratch fever", which my number two son dealt with a few years ago. Ironic it is as he is the ONE who gifted me with my Zekey boy! ROFL ... it's ALL good! I spent into the WEE hours of this morning scrapping some ADORABLE photos of my Zeke boy from two months ago when I found him to be VERY curious about the vase of Hawaiian flowers I had set atop the console table at the foot of our bed. He wanted SO badly to taste of the water in that vase!!! It was GREAT therapy and I scrapped until I was tired enough to go to sleep ... uhm ... let's see, it was sometime after 4:00 am PST!!! Hope to catch you all later tonight. Scrap HAPPY everyone and ENJOY the rest of this GORGEOUS week. I shall also hope to catch y'all up to speed on the results of my blood work ... let's just say I've been shedding tears of joy throughout the day since hearing back from dear Dr. Nguyen! A doctor, FINALLY, who GETS IT!!! EEEEKS!!! I nearly forgot. I wish to let you all know about a MOST fabulous GRAB BAG (NEAT, NEAT stuff) and an AMAZING new action for PSE (this is for ALPHAS) from the INCREDIBLY talented Brandy Oneal aka Mega Doodle Inspired!!! Not to mention TONS of FREEBIES from her FABULOUS "test team"!!! Please check her blog HERE for details and I'd LOVE to invite you all to join in with me as I attend one of her CHATS at Scrappin Freestyle for my VERY first time!!! I always seem to be a DAY late, DOLLAR short and THE LAST to know, but somehow managed to see this newsletter BEFORE it is TOO late!! WOO HOO!!! Here is the DIRECT LINK to SCRAPPIN FREESTYLE and even one to the CHATROOM! Hope to see y'all there! Okay, SOME of you! A girl can dream, can't she??? LOL! Anyhoo, CHAT time is at 10:00 pm EST and you DO NOT have to be a registered member to enter the CHATROOM! Just log in with the name of your choice. Brandy will, no doubt, have some AWESOME things to share with us and, of course, some GOODIES too! I LOVE you all SO much - you ROCK ... and then SOME!!! THINKING OUTSIDE OF MY PINGBOX!!! ROFL! OMGosh y'all - I am SO hooked on this NEW wonder referred to as the Yahoo Pingbox!!! 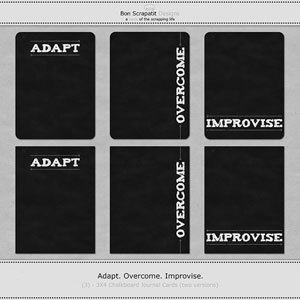 It is doing EXACTLY what I had hoped it would do in making for MUCH better communication here at Bon Scrapatit Designs! Speaking of communication, I had the MOST fabulous THREE-HOUR chat with the INCREDIBLE Ms. Vicki Parker aka A Work In Progress on SKYPE (free software download, free PC-to-PC calling and it is CRYSTAL CLEAR! I've tried many and this is the only one I will use.) yesterday afternoon! I have to agree with her whole-heartedly in that even though we are FAR apart geographically, we are VERY close in heart! I feel as though I've known Vicki FOREVER! It was SO very cool as I was able to hear an English phone ring (just like in the movies!) and I heard Pompey barking - he's SO sweet! My goodness, we just chatted on and on and on about our breed of dogs, our families, friends, homes and neighborhoods, shopping malls, traveling across the USA ... LIFE! Anyhoo, back to the Pingbox - last night I had three guests at once and MANY of my close friends know that I am meant to be challenged (or is it that I AM challenged? He, he ...) and it was QUITE fun toggling back and forth between three windows!!! I had a LOVELY chat with my LONG time blog visitor and DEAR friend, Ms. Nancy P in CT, the LOVELY Teri Mayo who does GORGEOUS CT work, a digi-sister from the Philippines and dear Lysiane who inquired about two of my *It's Falling* links that have gone awry! I'm telling you everyone, this is a FABULOUS customer service tool! Not to mention an INCREDIBLE way to get to know BEAUTIFUL digi-scrappers ALL around the world! Tonight I am posting early. 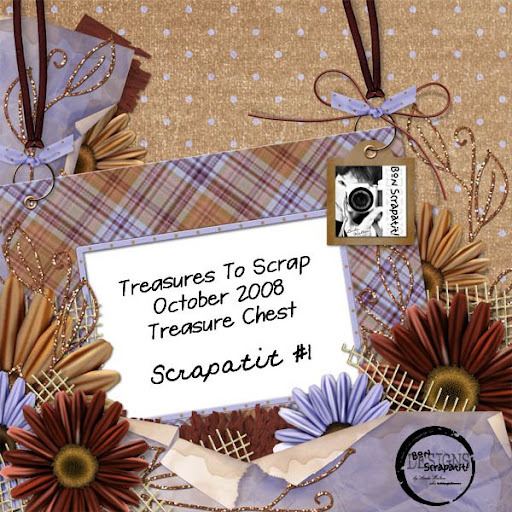 I have a SWEET little SCRAPATIT for you made from my pieces of the TREASURES TO SCRAP October 2008 TREASURE CHEST! I am REALLY liking the LAVENDER more and more and I hope that you are too! This LOVELY collaboration of multi-talented designers is ONLY $5.99 throughout the month of October! Head on over and take a PEEK at ALL of the GOODIES in this land of TREASURES!!! I had a few things planned to share, but will have to wait until tomorrow as I am being called to dinner and I've got to get to work right after dinner on a VERY special project!!! Details to be revealed at a later date! He, he ... I just LOVE the element of SURPRISE, don't y'all??? Ms. Vicki has her new kit for this week up and it's a BEAUTY, as ALWAYS!!! *Sweet Dreams* is ALL that it implies! See it HERE! 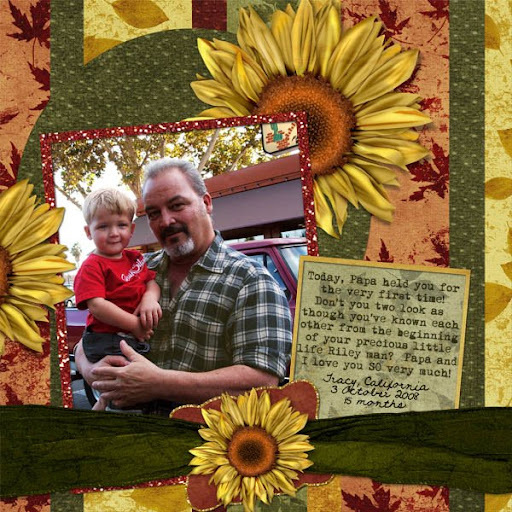 You must check out what Allie does with scrapkits - WOWSERS!!! I am in AWE!!! Check her out HERE! I've also added her to the BLOGS I FOLLOW! My TEACHER and MENTOR, Irene O'Neill has an INCREDIBLY beautiful THANKSGIVING/FALL overlay on her blog - grab it HERE! And, of course, y'all know to leave these LOVLEY ladies some lovin' for their hard work and generosity!!! OOOOPS!!! Had to leave for dinner and just before that I spoke with the LOVELY Ms. Rusty who stopped in for a Pingbox chat! Thank you Rusty - it was SO nice to hear from you! Oh, and Ms. Tami too!!! That reminds me, I've got to hunt something down for you Tami!!! Good thing I keep notes, but then it also helps to LOOK at the notebook from time-to-time, eh? ROFL! Night all ... see you in the morrow and REMEMBER: It IS Scrap Happy Hour 24/7 here in Scrapland, eh? You bet your sweet bippy it is!!! P.S. YAY!!! WOOOOOOOOOOO HOOOOOOOOOOOOO!!! I finally took a few minutes and figured out how to post my images FULL-SIZE!!! I like it this way SO much better as you can see SO much more detail and not everyone knows to click on the smaller images to get to the FULL-SIZE! out the storm door and watching the kitties playing in the front yard on a BEAUTIFUL fall day. whatsoever, so if I post a few in that manner, you will understand why!!! The time is 11:20 pm PST - link has been tested and is in proper working order! UHM ... TODAY IS FRIDAY, RIGHT??? She asks with a FLUSHED, beet-red face!!! HOWDEEEEEEY y'all!!! OMGosh! The weekend has gotten away from me and I 've neglected your FANTABULOUS FRIDAY FREEBIE ... I apologize! I've been having a "restful" past couple of days with my sweetheart and by the time I got onto the computer earlier this evening, I decided to have a little FUN with those that grabbed my attention via my Pingbox!!! Thank you ladies and gentleman for some WONDERFUL conversation!!! I had an opportunity to chat with Becky Jo from Pennyslvania who has made some LOVELY greeting cards with some of my designs and she sent me samples that I shall scan and share with you soon. I also chatted with one of our NEWEST and downright humerous male scrappers, SCRUBBIE from Ontario, Canada. If you've not yet been to visit, click on his name and behold his scrapping talent. You know, I just found out that he and his wife have owned not ONE, but TWO scrapbooking stores!!! WOW! They are ONE big SCRAP HAPPY FAMILY!!! By the way, I wish my Canadian friends a MOST "Happy Thanksgiving"!!! YUM, YUM, YUMMY, YUM!!! Y'all are making it hard for me to have to wait another month and a half for our celebration!!! OH, and PLEASE - those of you who have not yet heard OR stopped by, my VERY sweet and talented new friend, Kristine aka Wenchd Graphix (the AWESOME coordinator of the FALL SPLENDOR BLOG PARTY) has been celebrating her "42nd" birthday today!!! Kristine ALSO lives in Canada (I did not know this for sure until today but had a hunch!) and will be celebrating Thanksgiving with family and friends on Monday!!! Let's BOMBARD her with BIRTHDAY WISHES shall we??? I've already been and guess what??? Kristine is having ANOTHER party in celebration of her birthday and is giving us some MORE goodies along with several other designers. So HOP on over and see what she has awaiting us - it is MAGNIFICENT, it's MELLOW TWANG!!! Last Friday I gave y'all an EMBELLISHED WOODEN BRACKET FRAME in celebration of the release of this month's TREASURE CHEST at TREASURES TO SCRAP. Tonight, I am giving you a SAMPLER from my contribution to the TREASURE CHEST. You will find 3 - background papers, 1 - hanging wooden square frame, 1 - tied ribbon and matching bow, 1 - aged tag, 1 - eyelet, 1 - string bow, 1 - lavender daisy epoxy brad or flair and 1 - paper flower with jeweled center. Check out the link above (gold) to see the previews of ALL contributions from several VERY talented designers! 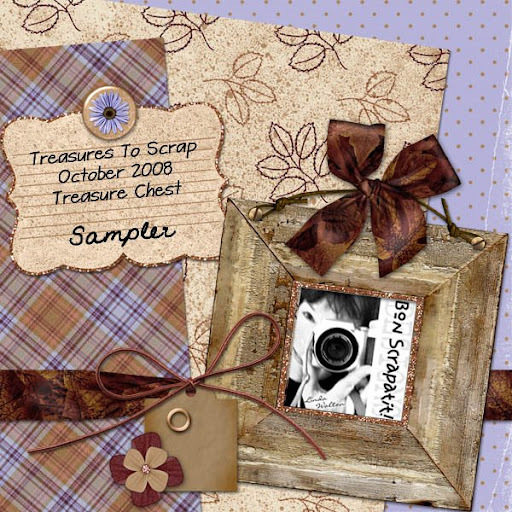 You will find LOTS of LOVELIES for ONLY $5.99 that will have you scrapping all throughout the year! Thank you SO much for looking!!! I'm off to bed and if you don't hear from me tomorrow, I shall see you on Monday with some NEW news!!! Until then ... SCRAP HAPPY and ENJOY the rest of your weekend!!! A LITTLE SOME "PING" NEW TO SHARE WITH YOU!!! Why, YES, I do have an alpha for you tonight, but I also have have a new toy on my sidebar which NO one has used yet, except for my BFF, Ms. Dawn of Snowsmoon's Design!!! And what exactly am I referring to??? If you travel on over to the LEFT, scroll down just a WEE bit, right beneath my e-mail address I believe, you will find my Yahoo Pingbox!!! What's a PINGBOX you ask? Until LATE last night, I would not have been able to tell you!!! ROFL! When I rebooted my computer and my Yahoo Messenger opened, there awaiting me was a message that I was now considered a Yahoo Messenger Power User!!! Uhm, er ... could that possibly mean that I really DO talk entirely TOO much??? He, he ... OMGosh, uh, YEAH! Shucks, all of my rambling on Yahoo has earned me a "crown" to wear beside my avatar!!! LOL! FANCY THAT!!! Has anyone else here in SCRAPLAND or beyond received that same message recently??? I am just SURE there has to be several of you, right? Ah, come on now, FESS UP - PLEASE don't make me feel ALL alone! Somebody out there can RAMBLE on MORE than me ... can't you??? HELP me here! TEE, HEE, HEE, HA, HA, HAAAAAAAAAAA!!! Okay, anyhoo, this NEW Yahoo Pingbox is going to be REALLY cool for those of us who like to get up close and personal with our readers and our customers. WHY? Well, I am looking at it like this - GREAT customer service at your fingertips, literally! If you go to the Pingbox with a question and you see the little YELLOW light on beside my name, that means that I am MOST likely sitting RIGHT HERE and if you type in a nickname (you can either use your real name or your screen name) and then type a message in the box, I will see a pop up in the lower-right portion of my screen that shows what you have typed. It will then open up a larger window (just like an IM window) so that I can start chatting with you LIVE! How cool is that??? Oh, and it is completely private and the only ones to see what is typed is YOU and ME! You don't have to have a Yahoo account to use it either - ANYONE can contact me! I get comments left sometimes that I try to answer in the comment section, but I don't know whether the person who has left it will come back to see if I've answered. If there is no URL or e-mail address left, I am out of luck trying to contact you. With the Pingbox, you can leave me a message letting me know I've BOOFED and left something out of a zip file or that the link is not active or not working. OR, if you have a question about something, I can answer you right "on the spot"! It works equally well from both sides I believe! I would LOVE to get some feedback on this and what y'all think about it. PLEASE give it a go. It will really be a HUGE help to me in whether it is worth keeping. I tend to believe it will surpass the CBOX! Okay, on to the goody! 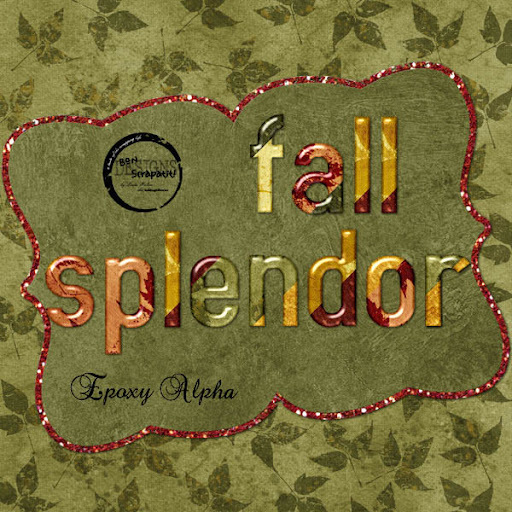 Tonight's addition to the FABULOUS *Fall Splendor* Blog Party IS an EPOXY ALPHA which includes a complete lower-case alpha, numerals 0-9 and some extras! We ALL know what tomorrow is, right??? Uh, huh ... 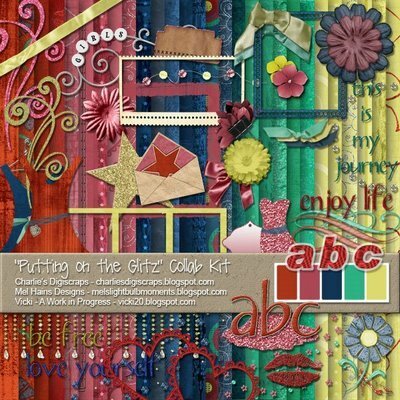 It is FANTABULOUS FREEBIE FRIDAY here at Bon Scrapatit Designs!!! Night all, SWEET DREAMS and THANK YOU, THANK YOU, THANK YOU for leaving such uplifting comments!!! I just LOVE reading what y'all have to share or think about something I've posted or given out!!! Y'all make me feel SO loved!!! MWAH! proper working order! SCRAP HAPPY y'all!!! A familiar tune to MANY of us, eh? The opening lyrics to the song, "Traces of Love" by the Classics IV!!! I just found the tune rambling around in my head and realized that the "faded photographs" that some of us have in our possession are, INDEED, "covered now with lines and creases" - BOTH of which we have invested a great deal of time in trying our darndest to doctor up so they look like they were just taken yesterday!!! Come on, you know what I'm talking about!!! ROFL! And, just what is my point you ask? Well, seems the tides are turning once again and it is NOW fashionable to scrap those "older" photographs just as they are!!! I have been in AWE as I've been out and about in SCRAPLAND to find some of the NEWER photo actions that are actually allowing us to "age" our photographs and, why just yesterday, I bought some VERY cool overlays from SOMETHING BLUE STUDIOS that you can use to "add" lines and creases to your papers and/or photographs!!! What a hoot, eh? LOL! Gotta LOVE the trendsetters!!! We can either take something "old" and make it look "new" or vice-versa, take something "new" and make it appear to be "old"!!! AMAZING isn't it? Okay, just a few silly thoughts going through my head tonight! It's been a CRAZY day with a bit of this and a bit of that and not much to show for it!!! Know what I mean? People needs, animal needs, phone calls and then you know we just HAVE to get up and fix ourselves something to eat in the midst of our work, right??? LOL! I tell you, I have to about force myself to eat sometimes as I'll get to going on something (not always computer related either!) and not wish to stop until I've finished or reached a place of personal satisfaction in whatever project I have going! Any of you relate to this at all??? LOL!!! Uh, huh ... I see those eyes lighting up with, "WOW", I am not the ONLY one who does this!!! Okay, come on now .... somebody out there better be with me on this or I'm in BIG trouble!!! ROTFLMBO!!! Guess what TODAY is??? Remember my daughter, Joan? The one who was just married in August and I created the *Summer Wedding* blog series for? TODAY is Joan's "29th" birthday!!! HAPPY BIRTHDAY SWEETHEART!!! Guess what happens NEXT year this time??? WOO HOO - the BIG "3-0"!!! Okay, please DON'T laugh now!!! From this sentence on, I am writing about today!!! The prior writings are from LATE last night into the wee hours of the morning after I left to visit my daughter's MY SPACE to leave her the FIRST "Happy Birthday" message and spent nearly two hours catching up with my children, other family members and their friends!!! ROFL! OMGosh - NOW I KNOW why I don't check "my" space very often!!! I'd NEVER get anything accomplished and I certainly did not get your FREEBIE posted now did I??? LOL! I have SO much to share and I have some "thank-you's" to deliver for yet MORE awards. I'm telling you, I feel so awful. Have you noticed that I've not yet posted ANY awards on my blog??? I feel guilty for doing so until I've gone back through and acknowledged those that have gifted me with them. I do apologize and I will try to get some of them posted ASAP! Gosh, I have SO much to tell y'all and it's just going to have to come in bits and pieces, just like the "memories" in the song, "Traces of Love"!!! He, he .... I know, I know, I'm BAD! But y'all know I LOVE YOU, right? Uh, huh, YEPPERS, I surely do! I'm kicking myself right now as I would LOVE, LOVE, LOVE to see some layouts from y'all from *It's Falling* and *Fall Splendor* but then I ONLY have myself to blame, right??? NO SLIDESHOW up yet! Okay, looking at the BRIGHT side of this neglect, y'all have LONGER to scrap some layouts to share!!! You can even use the "scrapatits"! WOO HOO!!! We are both off the hook now, eh? Okay, YOU are, I'm not!!! I will work on that tomorrow, God willing! Before I forget, a couple of you LOVELY ladies have sent me QP's (known here at Bon Scrapatit Designs as "scrapatits") and I will address those ASAP. 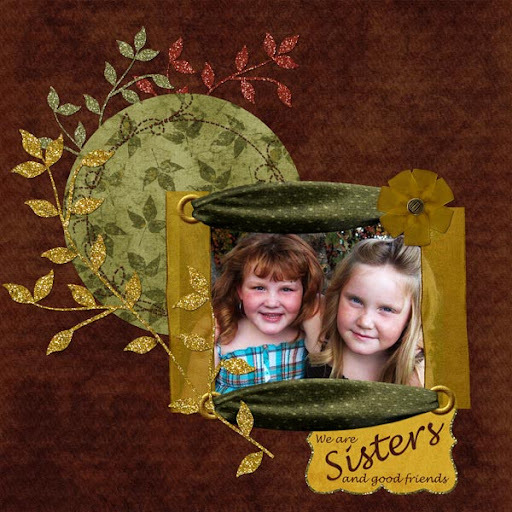 I have a layout share from my VERY sweet and dear friend Barb Derksen aka Olivia Dorazio from Sophia Sarducci's!!! Barb has used my portion of *Fall Splendor* to preserve some BEAUTIFUL photos of her GORGEOUS grand-nieces, Jordana and Madison!!! Don't you just LOVE the RED HAIR??? And those SWEET faces??? OMGosh ... we definitely need some girls added to OUR family!!! LOL! I LOVE how Barb has worked the different colored foliage up and around the CIRCULAR matte and then FRAMED these ADORABLE young ladies with the SHEER RIBBON and RIBBON-THREADED EYELETS!!! AWESOME layout Barb and I thank you SO very much for sharing with us! Barb is in the process of canning tomatoes this week. She has canned jam, peaches and other goodies as well as harvesting some Alfalfa Sprouts. Not ONLY does Barb DO this, she is SO good about sharing photos and EVEN "how-to's". Check her blog out HERE! While you are there, you will also find some FREEBIES posted. Barb's GOLDEN GUILDED LEAVES OVERLAY is GORGEOUS! Thank you again Barb for your continual GENEROSITY and for ALL that you do for ALL of us in SCRAPLAND!!! You ROCK girl! If any of you would like me to showcase your layouts here on my blog, please e-mail them to me at the e-mail address listed on my sidebar. I just LOVE seeing how CREATIVE y'all can get!!! Anyhoo, enough reading for y'all tonight and on to *Fall Splendor, Scrapatit #3*, which I made using pieces from my contribution as well as some LOVELY sunflowers, a ribbon wrap and a paper for the yellow-gold frame from my BFF's (Snowsmoon's Design) contribution. 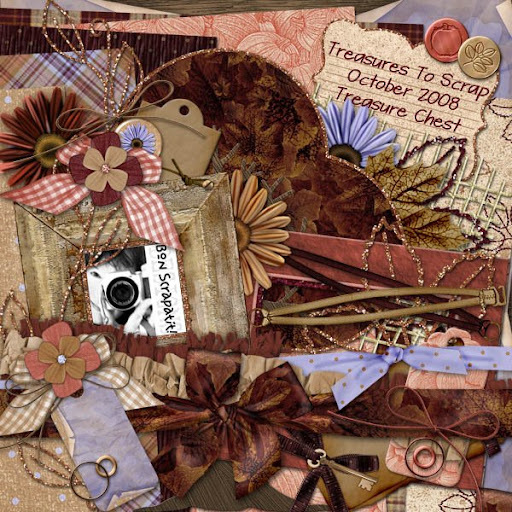 Make sure to check out Dawn's blog as well as she will also be adding MORE goodies to the *Fall Splendor* collection!!! If you've not been over there in the past day or two, she has a BEAUTIFUL scraplet up for grabs!!! I am using it to add to my "Meeting Riley" scraps!!! THANK YOU GIRLFRIEND!!! Make sure to leave her some LOVIN' if you download as well as Barb! Oh, I did wish to mention that I sort of took my time in coming to the computer today. I DECORATED!!! YAY!!! FALL is OUR favorite time of the year and Robert just LOVES it when the FALL decor is up! Lots of SUNFLOWERS, a variety of PUMPKINS, GLITTERY FOLIAGE (YES, I REALLY do LOVE glitter - LOL! ), decorated frames, wreaths, candles and such!!! In fact, Robert is out watching television right now with the coffee table centerpiece candle burning!!! He is SO sweet and SO easy to please! I am SO blessed. Funny thing is, he told me that if I didn't decorate, he WOULD!!! LOL! What a guy! P.S. Do you like the "epoxy" alpha I used for the title on my first layout??? If so, reply HERE on my blog and if I have enough interested, I shall finish it up and post it for you tomorrow! Riley man with his daddy, Joshua and his mommy, Tiffany! blonde hair and blue eyes! SOOOO sweet! My DARLING Robert holding his DARLING grandson! with me AND my camera upon leaving the restaurant! proper working order!!! Have a WONDERFUL, WONDERFUL! *FALL SPLENDOR*, SCRAPATIT #2 AND I OWE YOU!!! NOW YOU "C" IT, NOW YOU DON'T!!! 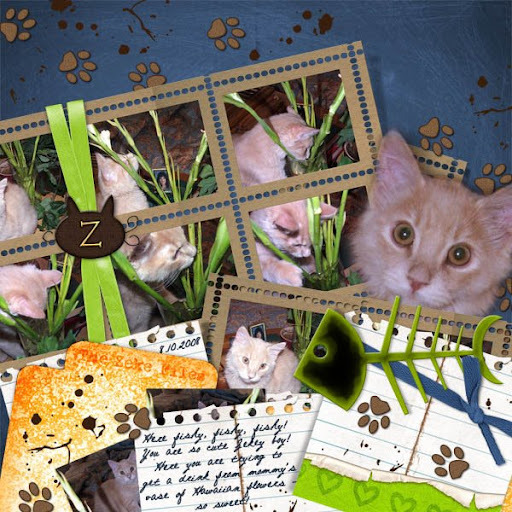 IT IS FANTABULOUS FREEBIE FRIDAY AND A PREVIEW!! !